Yay! The commissioned Irish Chain quilt is all finished and I can deliver it to the customer this afternoon. You can see it is queen size with a generous drape, 86×107 inches. 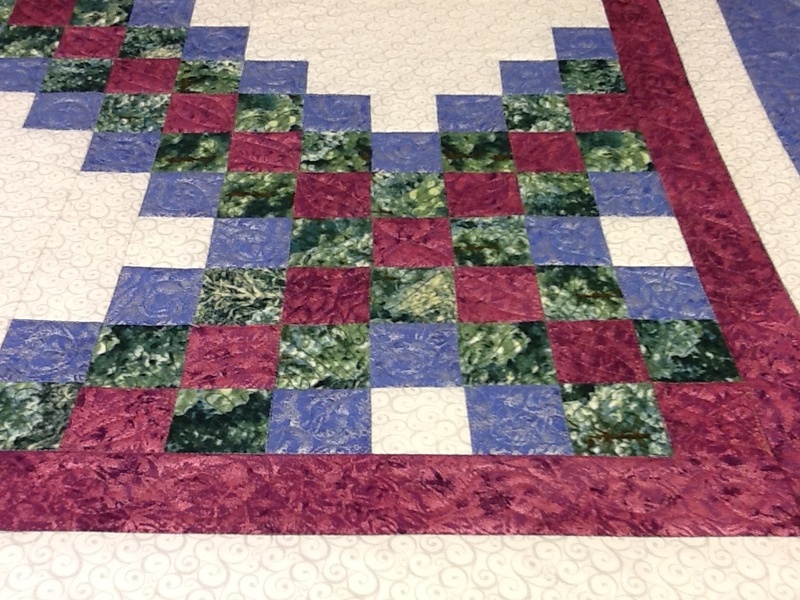 The blocks were 10 1/2 inches, the purple and white borders are 1.5″ and the final blue border was cut at 3 .5 inches. Here is another view of the back. The fabric is a light grey from the Stonhenge line, and you can see the variety of stiches with thread that matches the fabric on the top. Here is my feathered heart. Details on that tomorrow! They were fun to stitch. I finally feel at ease with feathers, hooray! 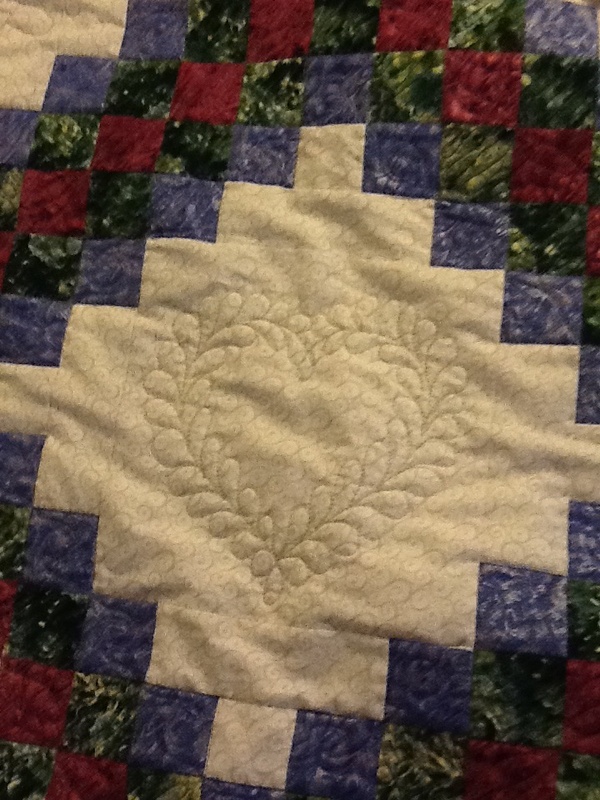 And my other trick on this quilt was using clip art. I printed the designs on regular paper, taped them down, and stitched over the lines. Yes, there is the pesky step of tearing away the paper, but I knew I was not enough of an artist to try those designs free hand! I think if you scroll back up to the first picture, you can see the anchor design on the bottom row, right by the cat’s back feet, lol. The correct yarn, Unisono, arrived, and I quickly cast on for the Evolution shawl. Not much to see yet, but it is an enjoyable project so far. And I dug out some pretty stitch markers, so I will have to take some detail pictures later in the week. 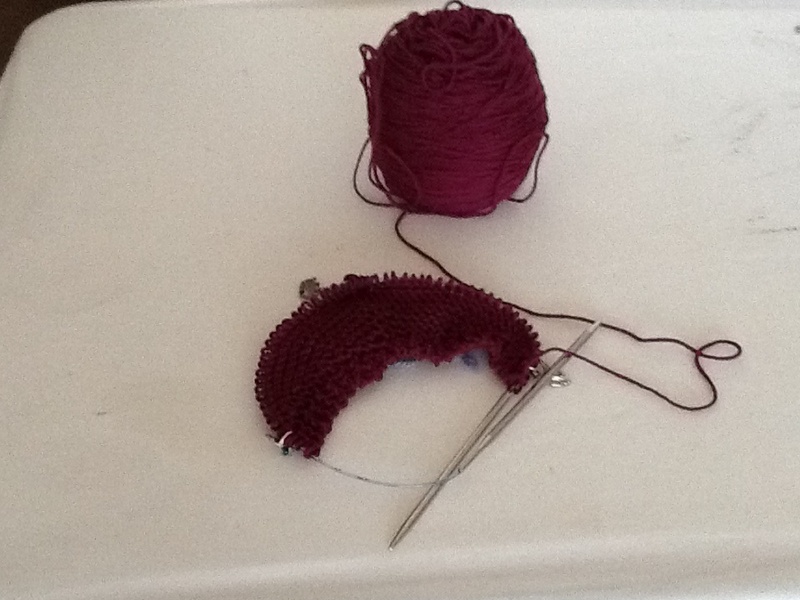 My biggest challenge so far is reading the “spine” stitch correctly so I can put the marker in the right place. I count the stitches every row to make sure it’s correct, but that will get tedious quickly when there are over 100 stitches on the needles. 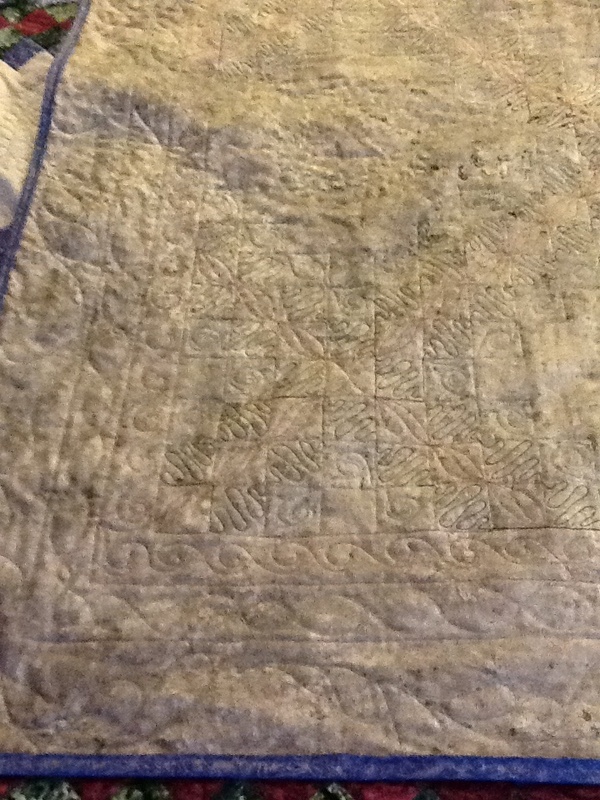 Can you see the quilting? I need to calculate how many little squares are in this quilt. 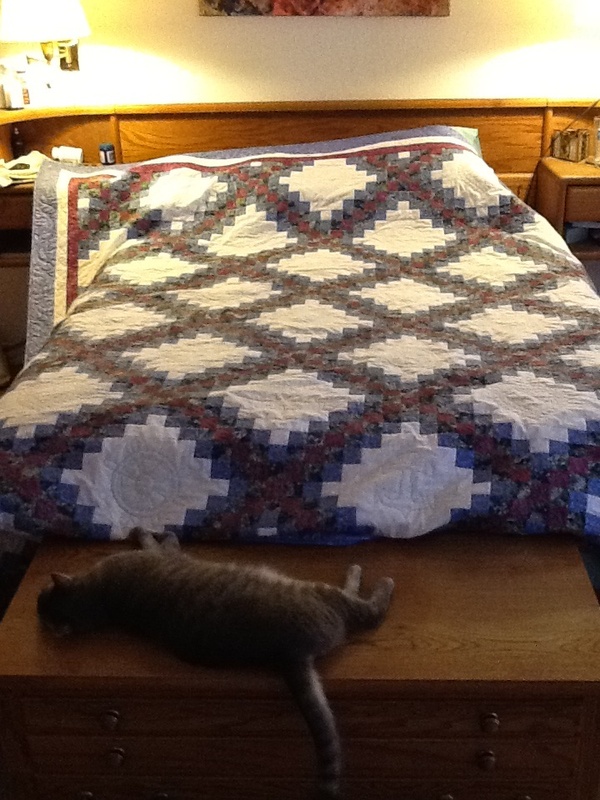 It’s a queen-size, 86 by 107 inches, and I did stitch in the ditch. Man, that was alot of work! 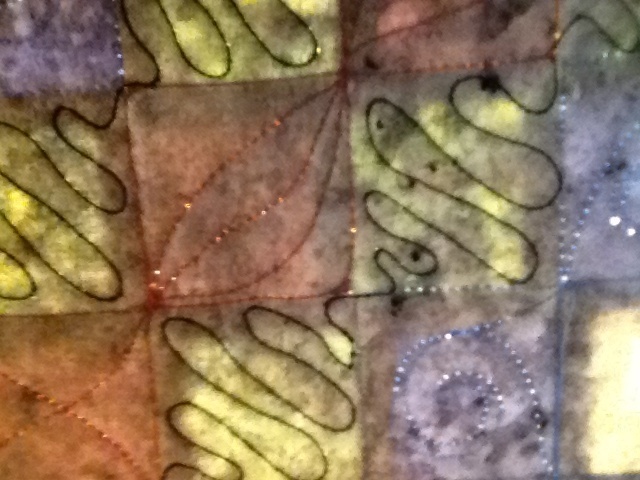 Here is a view from the back where you can see my different stitch patterns for the different colored squares. And here is the set up for the background squares. I wanted to do feathered hearts so I grabbed my Gamill Workstation…it’s the black board you see in the middle of the picture. 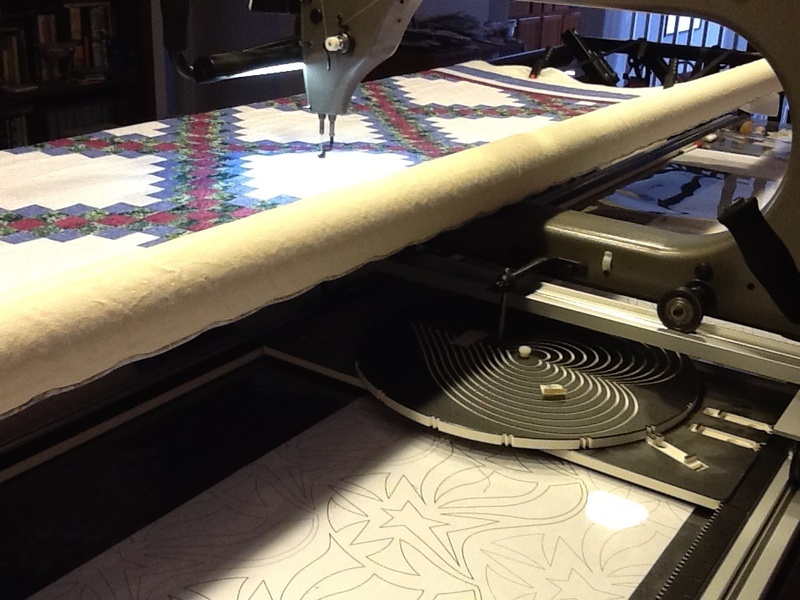 There is a stylus attached to the machine that fits into the grooves on the workstation, and it helps you stitch the designs with no “wobbles.” I was able to move pretty quickly, even with the adjustments of moving the board and screwing the stylus in place. Then I went back and stitched the feather free motion. I will do a photo tutorial of the feathered heart, because I think they turned out really well. 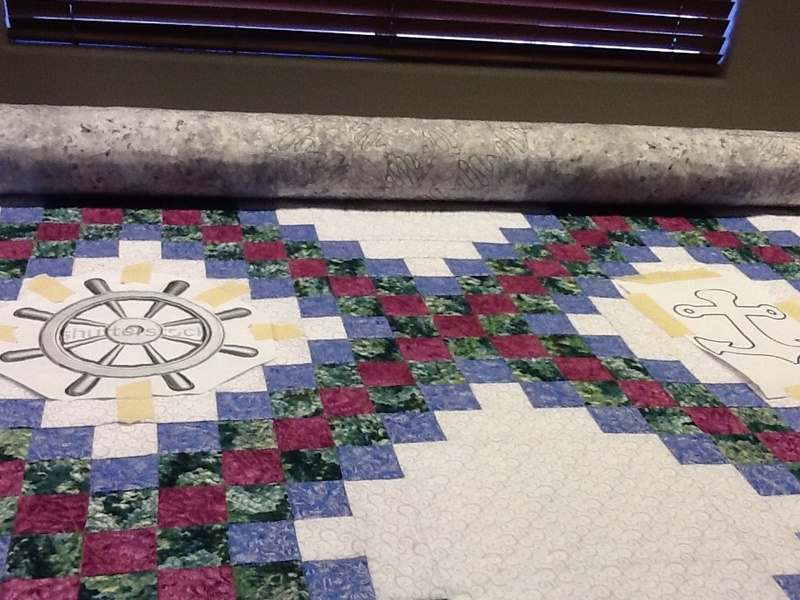 Phew, now I just need to get the binding sewn on and this quilt is out the door. Yeehaw! I am glad that this big deadline project is done. Now it feels like summer vacation has truly arrived and I can relax for a month before school starts again.